You know what I mean. That thing? It really isn’t that those reminders are different than they have always been, it’s just that you’re noticing it because of your life circumstances. What is the word/phrase for that? Hold please while I google it. I am just going to copy and paste my whole first paragraph into the search engine. That should work right? Here it is! It’s called the Baader-Meinhof Phenomenon. Read more here. Cool! That is exactly it! A chain of dominoes beyond my reckoning. This is all prelude to tell you I randomly selected a book in a used bookstore by Maeve Binchey called Scarlet Feather and to my surprise, it had two very interesting sub-plot lines about foster care. Weird no? No? Well, I thought it was. I’ve read things like One for the Murphys and The Language of Flowers but I sought them out, knowing they were about foster care. The Maeve Binchy book took me by complete surprise. And, kudos to Maeve, it wasn’t just a plot line because she needed her kid characters to be heroes sans responsible parents – that’s a theme I see (and hate) all the time. Binchy did a great job weaving in the two entirely plausible foster care stories into her bigger plot. I did not love the main characters of the book but boy-oh, I loved those two plot lines. 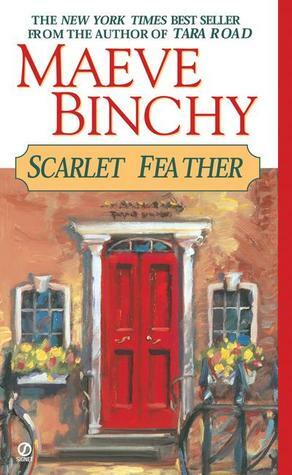 I read Binchy a long time ago (long before the million years ago when I was trying to get pregnant). I remember liking but dismissing her at the same time. Those two plot lines have convinced me to give her another chance. I have a feeling her books will be the Irish equivalent of comfort food. Stop me if I am wrong. Really. Stop me. I’m going to the library – right now. I enjoyed the phrase “smack of destiny” I may have to use that in a totally different way! Like, “Whoa! I just got destiny smacked!” Love it. Count me in!